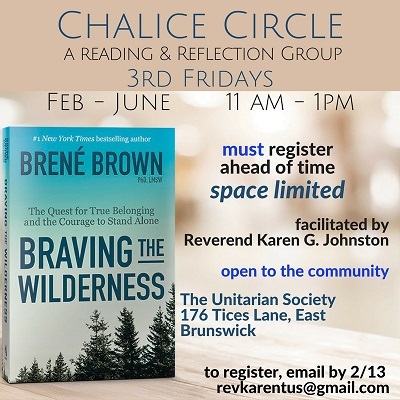 This small group reading & reflection group will explore the important issues raised in Brene Brown’s latest book, Braving the Wilderness: The Quest for True Belonging and the Courage to Stand Alone, allowing participants to integrate its wisdom into their own lives and find affirming accountability within the group. Attendance at all five sessions is required, including at the first group where we will develop a covenant of understanding. Open to the community, space is limited. We are a non-dogmatic religious community. We are a welcoming congregation so folx of all genders and sexual orientations are welcome to take part. To register, please contact Rev. Karen at revkarentus@gmail.com.